Parts: I. General Concepts of Similarity and Modeling. 1. Concepts of Dimensions and Similarity. 2. Development of Model Laws from the Buckingham Pi Thoerem. 3. Development of Model Laws from Differential Equations. II. Scaling of Air Blast Waves and Gas Dynamics. 4. Scaling of Air Blast Waves. III. Response of Structures and Materials Under Transient Loads. 5. Simulating Rigid Body Motion. 6. "Replica" Modeling of Structural Response under Transient Loads. 7. Dissimilar Material Modeling and Seismic Response Modeling for Structural Dynamics. 8. Modeling Penetration Mechanics. IV. Fluid Dynamics and Fluid-Structure Interaction. 9. Modeling of Fluid Motions. 10. Modeling of Fluid and Structure Interaction. V. Special Topics. 11. Modeling in Soil Dynamics. 12. Thermal Modeling. VI. Critique of Modeling. 13. Limitations of Modeling, Instrumentation and Building of Models. 14. Distortions and Accuracy in Modeling. Problems. General references. Bibliography. Here is the second revised and updated edition of probably the most practical sourcebook on similarity methods and modeling techniques available. Written by leading authorities who incorporate many of the latest advances in the field, this new work maps out techniques for modeling as well as instrumentation and data analysis for an extremely wide array of problems in engineering dynamics. 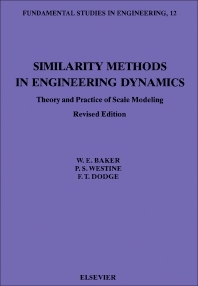 This practical reference uses experimental test data on various engineering problems demonstrating exactly how and why these similarity methods work. The problems involve spread of oil slicks, explosive cratering, car crashes, space vehicle heat exchange, explosive forming, and more. The spectrum of topics covered and number of examples are far greater than in other texts. Of particular importance are the dissimilar material modeling techniques which bring new versatility and freedom to the modeler in structural dynamics. The book also contains a clear, in-depth discussion of the theory underlying modeling and includes alternate methods for developing model laws. The work will undoubtedly prove invaluable to every professional involved in testing or design of dynamic experiments.